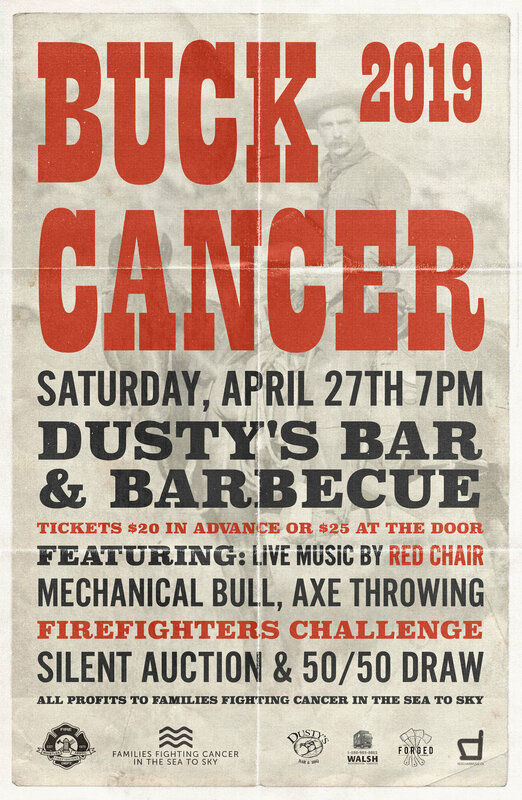 The much anticipated Families Fighting Cancer In The Sea To Sky's annual Buck Cancer fundraiser is April 27th at Dusty's! Ryan Donohue . Whistler Firefighters Association . Whistler Blackcomb . Scotiabank . Victoria Swayze . Dusty’s . Mike Varrin . Josh Kearns . Harrison Dobrochodow . Walsh Restorations . Whistler Brewing . Celebrate . Senka . Greg Garland & “Those Guys” . Alta Bistro . Escape Room . Showcase Snowboards . Nesters Market . Quantum Vitamins . Howe Sound Jeep Chrysler . Inside Out Boutique . Whistler Core . Local Automotive . GLC . Freedom Sportswear . Merlins . Forged Axe . RMOW . Whistler Happy Pets . Scandinave Spa . Bemer Whistler . Whistler Garden Center . Dr. Loridawn Gordon . Pan Pacific Whistler . Zip Trek . Samuari Sushi . Canadian Wilderness Adventures . Are You Prepared . Peak Performance . Creekside Dental . SureFoot . Mongoli Grill . Basalt . Garibaldi Graphics . Whistler Liquor Store . Slope Side Supply . Ryder’s Eyewear . SMD Automotive . Whistler Bungee . Beacon Pub. 3 Singing Birds. Kathleen Tennock . Sandee Bathgate . Bruce Allen Talent . Fanatykco . Nita Lake Lodge . Alpine North Limo . Bricks 4 Kidz . Shoppers Drug Mart . WOVA . Keir Fine Jewlery . Lisa Geddes . Aarm Dental . Whistler Bike Co. . Vincent Massey Pottery . Nesters Liquor Store . Araxi . Bounce . Simon D’Artois . Goggle Soc . Comor . Upper Village Market . Elevation Hair Studio . Lifemark Whistler Physiotherapy . Avello . Olives . Garden Shop at High Country . Aritiza . Mountain Paint & Décor . Howe Sound Brewing . Sushi Village . Little Bear Creations . 21 Steps . Fairmont Whistler Golf . Tourism Whistler . Coast Mountain Brewing . Lordco . Penny Eder . Blackcomb Snowmobile . Fifi’s Diner . Rim Rock . Performance Painting . Peak Performance Physiotherapy . Village 8 Theatre . Alpine Café . Blackcomb Barber Shop . Body Shop . Pure Bread . Starbucks . Armchair Books . Bean Around The World Brackendale . Wildwood . Zander Geddes . Bill Geddes . Kee Conin . David Conin . Corrine Allison . Rhegan Williamson . Michelle Williamson . Denise Taveira . Michelle Crowe . Justine Andrew . Emily Wood . Carolyn “Big Spender” Salantis . Luke Woodnut . Kevin Anderson . Scott Rogers . Jason Murphy . Tony Grabeling . Cedric Schell . James Ellis . Jeff Drummond . Dennis Van Dongen . Maria Brander Campos . Christine Burns . Jay Murphy. The much anticipated annual fundraiser for Families Fighting Cancer in the Sea to Sky brought to you by the Whistler Fire Fighters at Dusty's. Ride the mechanical bull! Bid on amazing silent auction items! Live band! Dance, party and mingle with friends all for a great cause! Many thanks to our sponsors: Scotiabank, Walsh Restoration, Dusty's Bar & BBQ, Whistler Brewing Company, Whistler Firefighters Association.